The on-course® team has recently analysed the most popular terms users entered in their on-course® search queries during the entire year 2015. The terms ‘Statistics’ and ‘Bioinformatics’ came out top with 928 and 297 search queries, respectively. Following up are the terms ‘Pharmacovigilance’ (279), ‘Pharmacy’ (243), ‘Personalised medicine’ (205), ‘Efficacy and safety’ (203), ‘Age related diseases’ (190), ‘Regulatory affairs’ (164), ‘Microbiology’ (135) and ‘Project management’ (120). 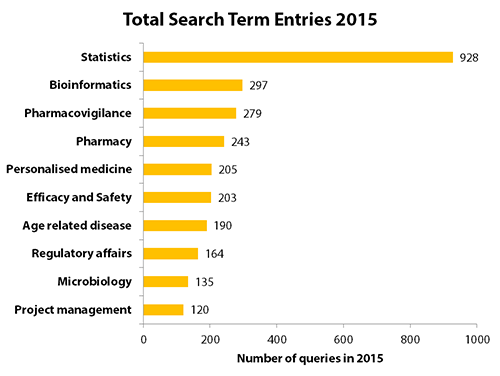 The popularity of the search terms ‘Statistics’ and ‘Bioinformatics’ within on-course® is closely consistent with recent data published in a report of the Association of the British Pharmaceutical Industry (ABPI). Their report says bioinformatics and statistics were among the highest priority concerns for UK pharmaceutical companies regarding their staff’s skills gaps. on-course® is a web search platform containing the most comprehensive database of courses and other education and training opportunities in the biomedical sciences from all across Europe. In addition to its advanced course search and editing functions, on-course® provides elaborate tools for statistical analyses of information in the database to monitor trends and gaps, as well as patterns of usage. on-course® has been conceived and implemented by the EMTRAIN project team (www.emtrain.eu). EMTRAIN, together with the IMI-funded projects Eu2P, PharmaTrain and SafeSciMET, is part of imi-train, the umbrella education and training project funded by IMI.